Reviewing the results of renovation at the Zimin Estate in Degtyarny Street in Moscow. 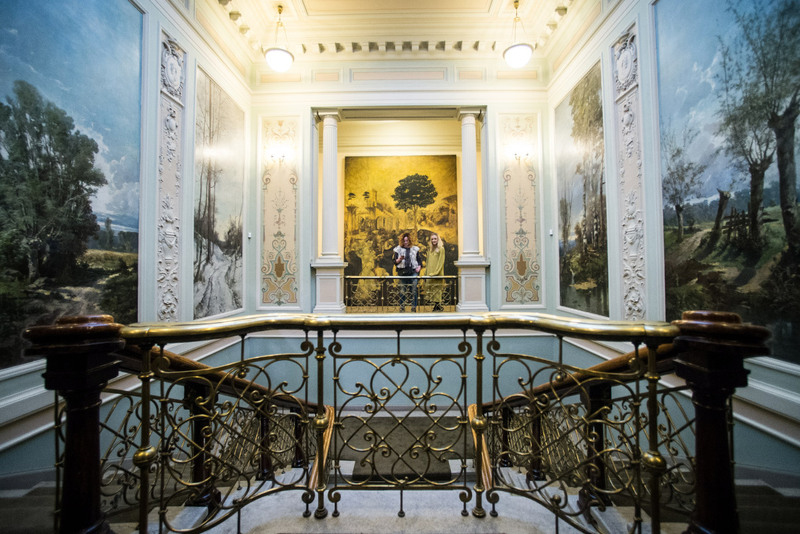 During May, Muscovites and visitors have a unique chance to see the "secret room" in Kitay Gorod, the halls of the old city council clerk and other splendid old manors from the inside. Many of the properties have never before been open to the general public. More than 100 events are planned in Moscow during a month that focuses on historical and cultural heritage through the end of May. There will be lectures, entertaining historical quests and excursions to architectural sites that are usually closed. A special surprise will be the opportunity to take a tour of mansions that today house foreign diplomatic missions. Those tours will be held on May 18. The House of the merchant Tarasov (Spiridonov Street, 30/1) was built in the best traditions of the Italian Renaissance. Its façade is borrowed from the Palazzo Thiene (Vicenza, mid 16th century). Its interiors also correspond to the Renaissance style. They are based on the contrast between bright walls and picturesque ornamental decorations on the ceilings. In Soviet times the Tarasov House housed USSR Supreme Court, the German and Polish Embassies and, from 1979, the Russian Academy of Science's Africa Institute. The Morozovs' townhouse (Podsosensky Lane, 21, bldg. 1) is a mansion that seems as if it has been imported directly from St. Petersburg. Vaguely reminiscent of the Hermitage, it has light green walls and statues of the Greek god Atlas supporting the balcony over the main entrance. The last owner of the mansion, Alexey Morozov, was a passionate collector and wanted to change the mansion's interior according to his taste. The décor was created by Fyodor Shekhtel, Mikhail Vrubel and Sergey Konenkov. It was from this house that, on February 16, 1907, a coffin bearing the body of Nikolay Schmidt, a relative of the mansion's owner and participant in the armed uprising during the first Russian revolution, was carried out. In the 1920s all of Morozov's property was nationalized; his collections were broken up and distributed among various museums. Architect Edmund Yuditsky designed and built the Ziminy Mansion (Degtyarny Lane, 8, bldg. 3) in 1896. This building is considered one of the best-preserved mansions of the late 19th/early 20th century. Commissioned by wealthy tobacco factory owner Nikolay Zimin, it is built in the style of Late Historicism and its façade is decorated with avant-corps - built extensions that jut out - and Tuscan columns. It contains a hall that doubles as a home theater. In the 1920s the mansion housed the Directorate of the Y. M. Sverdlov Communist University and then, until 2015, the VGIK Cinema Scientific Research Institute. The townhouse of Vasilchikova, Obolensky and von Mekk (Gogolevsky Boulevard, 14, bldg. 1) is a mansion that was built in the 1820s in Baroque style and once was one of the centers of Moscow musical life. Here the owners entertained Fyodor Shalyapin, Sergei Rachmaninov and Alexander Glazunov. In the Soviet era the mansion housed the Supreme Court and served as a residential building for political émigrés. In 1956 it became the Central House of Russian Chess Players. The old cathedral (Donskaya Square, 1, bldg. 18) is located in the middle of the southern part of the Donskoy Monastery in the center of Moscow. It is called Malyi (small) Cathedral. The cathedral was built 1591-1593. Historians believe that its architect was the Muscovite Fyodor Kon. Unusually, there are no pillars supporting the cathedral roof: Its vault and cupola sit on the external walls. Until this year it was rather difficult to enter the cathedral. Usually services are held in the Great Cathedral and to visit the Small Cathedral it was necessary to wait for important church holidays. The mansion of city council clerk Averky Kirillov (Bersenevskaya Waterfront, 20), a small red baroque building with white ornamentation on the façade and a white porch, always attracts glances from passersby. Archeologists believe that the wooden house with a stone ground floor was built in the 15th-16th centuries, but was only documented in the 17th. The mansion's current appearance dates to the time of the last of the Kirillovs, city council clerk Averky Kirillov. It consists of a two-story house, a low wooden belfry and the Nikolsky Church. In 1870 the building became the center of the protection of Russia's cultural heritage: It housed the Imperial Moscow Archeological Society. Today it houses the Russian Cultural Studies Institute. Tours are free but guests must register. They take place twice a week until May 30. All the sites can be viewed here.